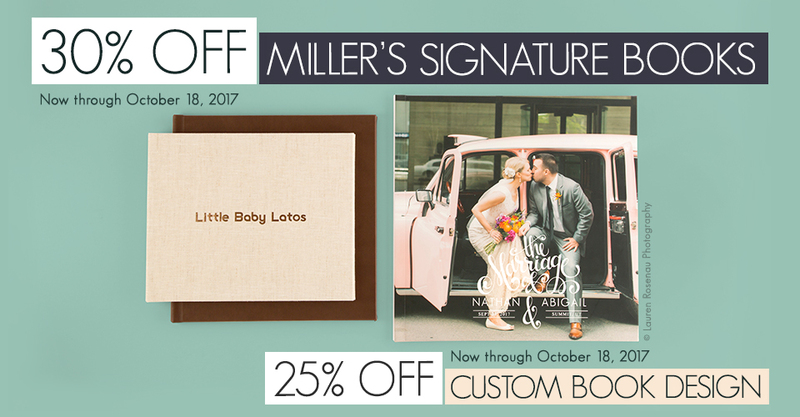 Enjoy 30% off Miller’s Signature Books and 25% off Custom Book Designs through October 18th. Create a charming coffee table book for your fall clients featuring premium press paper and your choice of a Bonded Leather, Faux Leather, Linen, Softcover or a Custom Image cover. Not enough time to design your book? Let one of our in-house designers make a layout to fit your needs and we will provide a proof in only 2-3 days. Please note: This sale is valid for Miller’s Signature Books only. Add-ons (Foil Stamping, Debossing) and Miller’s Signature Albums will not be discounted. Sample Books do not receive an additional discount (samples are discounted by 25%). This offer is available through ROES and Designer Plus, no code necessary. The sale price will not be reflected in order summaries or confirmations. The discount will appear once the order has been received by the lab. This offer is not valid on orders placed prior to the sale and custom designs must be approved during the sale. Please note, the cost of the Custom Book Design does not include the cost of the physical book. The sale price expires October 18th, 2017 at 11:59 p.m. (Central).